It's unclear how the new premier will tackle rising auto insurance rates. Now that Doug Ford's PC party has won the election in Ontario, what could this mean to the premiums you pay for auto insurance? It's a topic that over the course of the campaign both the Liberals and NDP touched on, but it's unclear what the PCs plan to do now that they're in power. The party's Plan for the People does not specifically address the subject of auto insurance in the province. If history is any indication, however, it is a topic that will require the new premier's attention. For the past two quarters (Q4 2017 and Q1 2018), the Financial Services Commission of Ontario (FSCO) approved rates that increased on average 1.03 per cent and 2.23 per cent respectively. And while an average increase of one per cent here and two per cent there may not sound like a lot, it is a disturbing trend for Ontario drivers who already pay the most for coverage than drivers in any other part of the country. Will the PCs end auto insurance pricing based on where you live? In the past year, but not under Doug Ford's leadership, the party has said it would end auto insurance pricing that takes into consideration where you live. Currently, drivers in urban areas generally pay more for coverage than drivers in rural locales because insurer's typically see more frequent claims in areas that are heavily populated and with more people on the road. 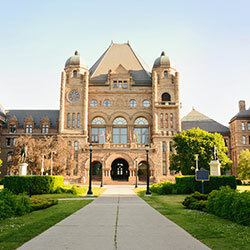 To help drivers in Ontario's biggest cities, the party previously indicated they would eliminate this rating factor while protecting the premiums drivers pay in the less populated areas of the province. It certainly isn't out of the realm of possibility that some variation of this idea is still in the line of sight of the province's new premier. With almost 10 million drivers in the province, one thing is for certain: Premier Ford and his government will be tasked with helping drivers better afford their auto insurance premiums. It's just unclear to date how he will achieve this goal. If auto insurance rates are still trending upwards when FSCO releases the Q2 2018 approved rate changes in July, it's likely we'll learn of the premier's plans sooner rather than later. Auto insurance in Ontario is likely going to change in the years ahead, but only time will tell to what extent. In the meantime, the best way to ensure you're getting the lowest price possible is to regularly shop around, at minimum when it comes time to renew. At Kanetix.ca, we search for your lowest rates so you can be confident in what you're paying. Compare auto insurance quotes today for the best deal on your auto insurance.